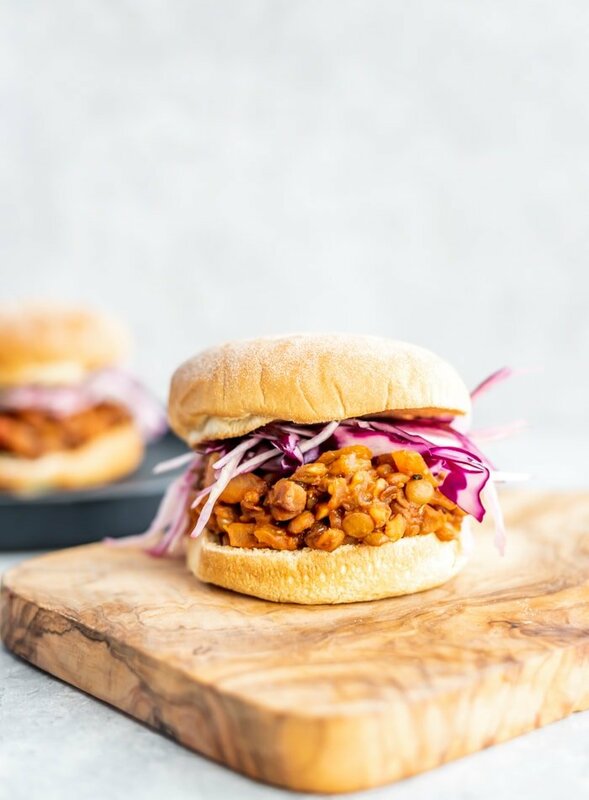 These vegan sloppy joes recipe is made with lentils and easy to make in just 30 minutes. This dish is sweet, tangy, spicy, hearty and savory, all the good things. You can’t beat them for quick, filling, healthy and delicious vegan dinner that’s high in fiber and protein. 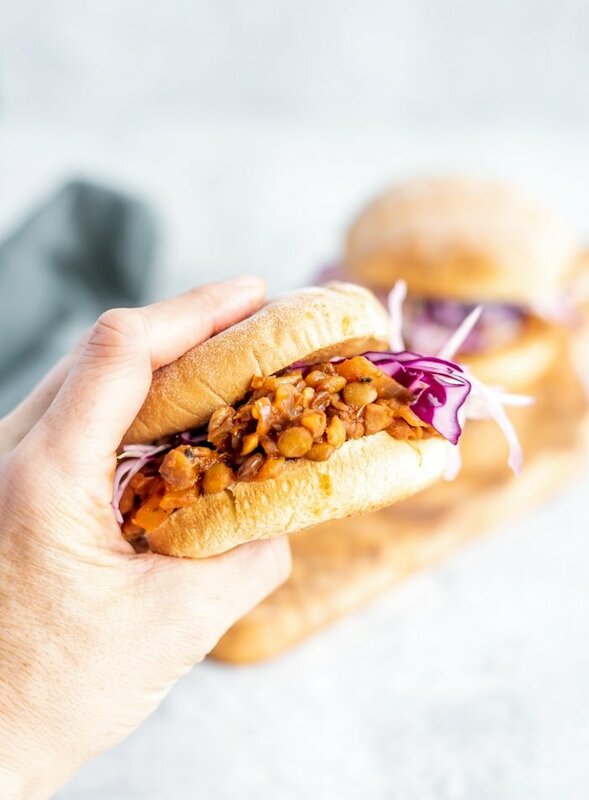 The best part about vegan sloppy joes is they’re super easy to make. I love them for a lazy dinner. Basically, add a bunch of stuff to a pot, cook it for a bit and you’re done. The whole recipe takes just 30 minutes. Once they Sloppy Joe mixture is cooked, it’s just a matter of piling it onto a toasted bun and digging in. To make a delicious, tangy and sweet sauce, I used tomato paste, tomato sauce, apple cider vinegar, chili powder, cumin, maple syrup and soy sauce. Easy. A lot of vegan Sloppy Joe recipes call for vegan-friendly Worcestershire sauce but I couldn’t be bothered to add any to mine since it’s not an ingredient I ever use. If you have some on hand and want to add 1-2 tbsp for more depth of flavor, you can use it instead of soy sauce. The best lentils for Sloppy Joe’s are green or brown lentils. Red lentils would come out mushy and while you could use French or black lentils, they’d be a little on the firm side. In a pinch, you can definitely use any kind of lentil, even canned lentils but I like these best with green ones. Green lentils are just right. They hold their shape through cooking but have a nice, tender bite to them once cooked. 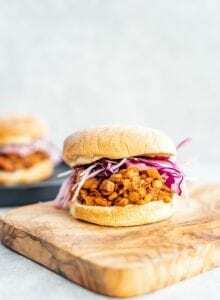 I haven’t tried this recipe with anything other than lentils but since we’ll be cooking the lentils separately and then mixing them with the rest of the ingredients, you could try this with something like chickpeas, black beans, navy beans or even rice or quinoa. I think crumbled tempeh would be good too or a mix of any of these ingredients. Alight, let’s take a look at how you can get this done in 30 minutes. Start by rinsing the lentils then adding them to a pot with the water then bringing them to a boil stovetop. Once they’ve boiled, cover and reduce to a light simmer for about 20 minutes until tender. If there is any excess water leftover, drain it off. While those are cooking, quickly chop the onion, garlic and bell pepper and then proceed with the rest of the recipe. The whole process should take 30 minutes. When the Sloppy Joe filling is just about finished, prep some buns by toasting them in the oven. Once the buns are toasty and the Sloppy Joe mixture is nice and thick, pile it up on the buns and dig in! They’re a little messy but very good and the leftover lentil mixture only gets better the next day. Try using the leftovers as a baked potato topping, in tacos, for chili cheese fries or just on its own as lentil chili. 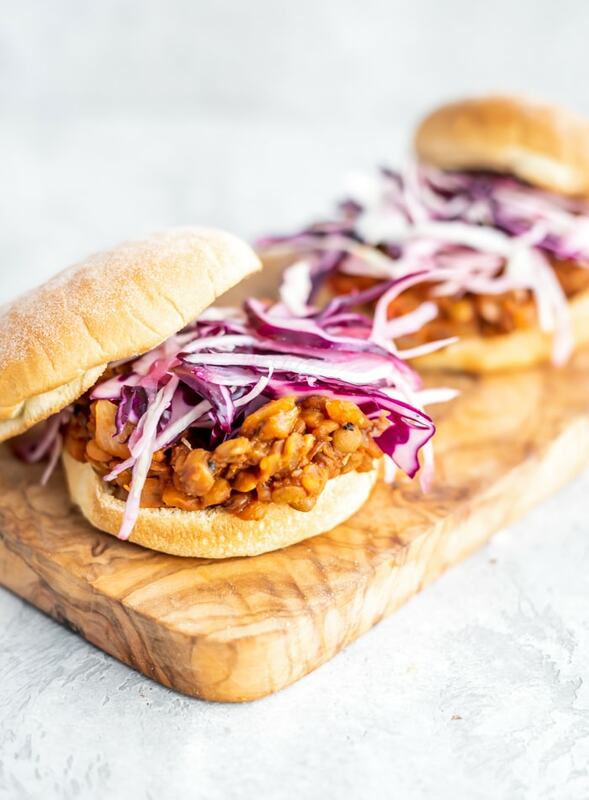 To top off my Sloppy Joe’s I made a quick cabbage slaw by mixing a few cups of very thinly sliced cabbage with a few splashes of vinegar and 1 tsp of sugar. It’s the perfect crunchy, tangy topping for these. If you don’t’ feel like having a bun, a big pile of slaw with a scoop of lentils in a bowl is really good too. These look SO good Deryn! Perfect winter comfort food to beat these January blues.